LOGAN, W.VA. — A classic much-sought-after book about the history of Logan County, which has been out of print since 1976, will soon be available again. “Several months ago Woodland Press was granted permission by the Robert Spence estate to reprint the critically acclaimed work, 'The Land of the Guyandot',” said Keith Davis, publisher of the independent book publisher located in Chapmanville. “I still remember the local sensation when the book was originally released. It’s difficult for me to believe that was thirty-seven years ago— seems like yesterday,” Davis said. Even so, Land of the Guyandot remains the primary resource for county history for those lucky enough to find an old copy of the book. According to Davis, no other work comes close to capturing the depth of Spence’s ambitious research. “When given this awesome opportunity—to reintroduce this timeless classic to an all-new generation of West Virginians—needless to say, I jumped at the chance,” he added. Davis says the book is already available for pre-order and orders should be delivered by Christmas. It contains 472 pages of rich county history, including over 50 pages of rare photographs, extensive footnotes, a bibliography, and maps. Spence interviewed over 35 area residents from yesteryear, who discussed their memories of life and survival in the rugged mountains during the area’s earliest days. Subjects covered include the region’s geography; its original American Indian inhabitants and the first white settlers; the Hatfield & McCoy Feud; railroad, mine and timber industries; the origins of Mingo County; the mine wars (including Battle of Blair Mountain); the Holden Mine disaster; the Buffalo Creek Flood; politics; earliest schools, healthcare, and church foundings; and much more. Rather than being just a straight reprint of the 1976 book, this new edition actually contains some additional writings compiled by Spence in 2003. “Since he never ceased to research Logan County’s past, Robert continued to add fresh historical material, although still capping off with the year 1976. The end result is something I believe readers will appreciate and treasure,” Davis said. During that period Robert Spence worked on the project day and night, always having a clear vision of where he wanted to go with the historical material he was collecting, culminating in the launch of "The Land of the Guyandot". The people of the region accepted it with great appreciation. Davis said he and Spence crossed paths professionally on a number of occasions after that, including working together for a while at the daily newspaper, The Logan Banner. “Several years ago I had the great honor of publishing his second book, 'The Tale of the Devil: The Biography of Anderson ‘Devil Anse’ Hatfield'—the national bestseller that he co-authored with Dr. Coleman C. Hatfield, grandson of Devil Anse. 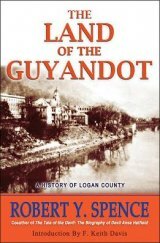 For more information about 'The Land of the Guyandot', see www.woodlandpress.com, or call Woodland Press at (304) 752-7152.